Update: I’ve updated this post with new rules and more clarification of the rules. Old rules are struck out, with the additions in italics. Rules that stay the same are unaffected. Please see this post for a complete update on how the exploit reporting feature is working out. To further prove our dedication to exploit exorcism, we’re offering a limited-time exploit bounty of L$ 10,000 to the resident who first reports an exploit via the inworld bug reporter and tags it as an exploit. The bug can be used to steal or create Linden Dollars (L$). The reproduction case must be clear and immediately reproducible. You must provide steps I can follow at o’dark hundred in the morning, SLT. Blank bugs will be deleted, cursed and and may get your avatar reverted to Ruth at my discretion. You must not post the exploit to the forums, distribute notecards with the repro case or otherwise publicize the exploit. You must not use the exploit for personal gain. Only the first resident to report a specific exploit with a clear and reproducible reproduction case will receive the bounty. This offer is valid from August 2, 2006 until September 30, 2006**. One bounty per resident, not one bounty per exploit. In the case that multiple residents report the same exploit the first one who reported it with a clear and reproducible repro will get the green. Please note that this is not a hotline to Linden. It should not be abused or used for anything other than exploits. These reports will wake me up in the middle of the night, causing me to get out of bed, trip over my laptop, curse the person who woke me up and start repro’ing your bug — all without coffee, contact lenses or daylight! Bug reports that are clearly not exploit reports will not only be ignored*** but could also get you added to a no-email list. Abuse of the system could also garner abuse team action (harassing Lindens in the middle of the night counts as abuse). Please keep this in mind when you try to slip a regular old run-of-the-mill bug under the radar! We hope this helps prove our commitment to stopping exploits. We ask in return that you do not post exploits to the forums, Linden blogs or talk about them inworld. *Actual developer response time and fix deployment will vary. ** Please see this post for clarification as to what an exploit is and is not. *** Crying wolf will get you removed from my holiday card list, your bug will be deleted and you will be asked to enter the bug again using the conventional options. This entry was posted in Bugs & Fixes, Quality Assurance. Bookmark the permalink. Sounds like a good plan, forum posts lead to hastles, and these should be patched as soon as they’re found. I like this idea. Very cool of you to do. Now I know how to contact you when I need companionship. Ok I think you need to add that the reporter cannot have run amok using the exploit they reported for personal gain prior to, during or after reporting it. I can see an enterprising hooligan doing exactly this. Y’know, I was talking about something like this. Cookie for you, sir! One question, is there some type of warning/explanation in the bug report tool about this? Because the average resident will not read this blog. Offcourse, i think bug reporters mostly aren’t the average users, but it would be sad if you get waked up at multiple nights and have to send hte abuse team on someone, just because they do not know it is the Brent Linden hotline. I just wanna know how to get on Brent’s holiday card list in the first place. I hear there’s some racy stuff that goes around. Frans, we contemplated such a warning but didn’t want to scare residents with the bug reporting tool. 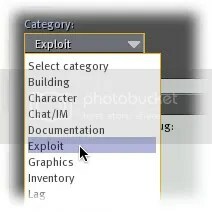 There is some language at the bottom of the bug report window that explains what to do if you have found an exploit. If it is insufficient (read: Brent gets a blank bug report at 4 am marked Exploit) we’ll add more protection layers. Something I was toying with was only sending the email if the user has payment info on file. That way folks using anonymous accounts won’t be able to disturb my counting of bugs as they jump a fence. Sounds like a great step in the right direction Brent! Two thumbs way up for implimenting this both as a way to patch security holes and to show your dedication to making SL better! YAY! you heard us!!!!! wonderful news, thank you Brent for um “volunteering”to be up at unspeakable hours..this could just work, im so excited…thanks..thanks..thanks!!! Only thing I worry about is..
Now you may be able to partake in the joy of griefers the worst way possible, lol..
— I hope not, It’s otherwise very cool..
Uh…. *looks around* Yes, first exploit is mine! >> # You must not post the exploit to the forums, distribute notecards with the repro case or otherwise publicize the exploit. Does this mean Linden Lab will continue its new policy of “suspend users for 3 days for warning people, even if they do not specifically detail what the exploit is”? I think this is a good solution. It gives SL users as near a direct line to a Linden to report exploits and make sure they are looked at post haste. If the Lindens find the exploit to be high risk enough, they can decide to warn the users and even bring down the grid. It’s certainly much better than people posting about exploits on the forum. Here is hoping that the system works well and that exploits die a swift death once found. Are you really “proving your dedication to exploit exorcism” when the bounty you’re paying costs you absolutely nothing to provide? If L$ “have no value”, aren’t you really saying that you don’t place any value on your users’ exploit reports? If you really want to prove yourselves, then offer *real* cash for any verified bugs (like Donald Knuth does for anyone who can find a bug in TeX). Paying out with database bits you can generate instently and arbitrarily isn’t terribly impressive. I am curious as to what will be done about the content that has ALREADY been exploited/lost because of bugs and/or exploits. Just kiss it goodbye? How about some responsibility along those lines? Great blog. Simple enough that a 3 year old could understand. Ill be sure to pass this info off time my friends in-world. Awsome dedication! I know it is just an idea but it is not fair to exclude bug reports to residents that only have payment info on file. If you were to enact it I would not be able to send bug reports. Please take this into deep consideration. Good idea, but why limit it time wise? This is an excellent method of doing QA testing and rewarding folks that do it as a full time gig in SL. Certainly cheaper than paying a RL person to do it. I think they bounty is set just high enough to get some folks attention. Brent Be careful but then again with each new release of Secondlife. There’s always potential “bugs” some exploitable some not. How ever there’ll probably be new exploitable bugs poping up in the new releases as they come avalable. As new features are added and others are taken away. I enjoy seeing someone that is as dedicated as you. …But in the exploit hunting race and Linden hungy eyes, shouldnt u set a age limit for the Residents reporting this but til atleast Yesterdays date since ppl can sign up now pretty easy w/o payment info. If no restrictions here ppl just pop 2 chars and report 2 exploits. And u got a babyboom in SL in the name of making it exploit safe. Should make a clear statement on that 2, with 350k+ residents im sure atleast 10k of those would like to make a new avie just to get another 10kL or a shot at it. Not only aves you a world of hassle, also makes the exploit hunt serious from start. Good luck with this project. I wish you great success, and few (or no) late night calls. “warning people, even if they do not specifically detail what the exploit is�? is like shouting “fire!” in the middle of a church without knowing about there is real fire or not. PS: I’m the subproduct of a hyper-nationalist culture – sorry for the bad english. So wait, does that mean we can’t get the bounty if we don’t have a credit card on file with you..? That doesn’t really seem fair…. I’m not involved with any abuse stuff. The rules above apply to bounty eligibility. Good plan – just hope it doesnt spawn new hackers! Though its nice to have the residents searching these problems out – just hope you can keep up with the solutions as fast as the problems are reported! From past experience as a bug hunter in other games…the ratio of reported bug to actual fixed bugs is usually horrible and depressing. Rewards for exploit reporting is a great idea – maybe after Sept 30 – you can still reward people a bit – im sure even 1000 or 2000 would be incentive enough. Like with the last exploit and residents locking their sim or land to protect themselves…..
Maybe put an In Game option for land owners that they can toggle on or off that if you (The Exploit Team) are notified of an exploit that could ruin someones ingame life or mess it up terribly – that you could activate a system and anyone that opted for “Auto Exploit Lockdown” would have a blockade put up on their land so no one could mess with the owners property or get into it until the exploit is fixed or the owner wishes to reopen?? sound like a plan? Nice ^-^ This sounds like a good addition. I hear the first bouny has been paid ! Woo! Sounds like a smart move in my oppinion..
Azzura: We already have that option: Land banning and access restrictions. Check out my update on how the new feature is working and some of the changes we’re making. Watch for further up-to-the-minute information in this blog! I suppose the restrictions mean I should not file an exploit report for every occurrence of gray textures with white outlines. Darn. Using the “secondlife�? tag on a post in the Second Life Blog is kind of extra. It tends to obscure the Tag Cloud (where secondlife is currently the biggest tag). * The bug can be used to steal or create Linden Dollars (L$). 3. You must not use the exploit for personal gain. Could you please suggest appropriate protocal to legally and unoffensily comply with BOTH of the above?